For India, this was a really disconcerting development given the recent history. Just a few months ago, its gigantic northern neighbour China had been won over by the Communists. While Washington had decried communist victory in China and adopted the most hostile attitude possible, India was in no mood to make enemy out of Peking (now Beijing). Nehru believed that the best bet for India was to sow dissension in the communist camp by splitting China and the Soviet Union. So for the past few months, India had been slowly working to calm the paranoid Chinese regime. American troops in Korea, so close to Chinese borders, were not going to help the matters. Over and above this, was Nehru’s larger fear that Korean War may devolve into a final showdown between US and Soviet Union, dragging India into a World War. Nehru wanted to bring the war to an end quickly. So, only a few days into the fight, he wrote to Soviet premier Stalin in hopes of getting Soviet Union to bring peace. Stalin replied immediately with a proposal of resolving the war by talks which seemed reasonable to Nehru but not to Washington. While the Nehru (and separately the British) was trying to find a peaceful situation, unprepared and ill-equipped American troops were getting hammered by North Korea. United States, shocked at being driven to the wall by a rag-tag Third World army, was in no mood to compromise. Instead, the American officials felt betrayed by the fact that India and Britain were suing for peace when they were preparing for war, and thought that they needed to be “straightened out”. United States set about mobilizing a much larger force to oust the North Koreans. But Indians were sceptical. Indians wondered: what was the use of retaking South Korea after eight months of mobilization, by which time North Koreans would have killed off all democratic forces within the country. Instead, United Nations needed to negotiate North Korean withdrawal immediately. And this, by New Delhi’s calculation, was possible if the communist camp was given something in return – membership to Communist China in the UN. However, neither India, nor the US could convince each other and relationship between the two countries deteriorated. Nehru kept losing respect for the Americans, who he irritatingly dubbed as “most hysterical as a people than almost any others except perhaps the Bengalis”. Nevertheless, Nehru continued to be the key contact for every player in the war from Britain and the United States to Soviet Union and China. The New York Times happily declared that the struggle for Asia “could be won or lost in the mind of one man – Jawaharlal Nehru”. By September, the tides of war were turning. Americans finally got North Koreans on the run by carrying out one of the most brilliant military manoeuvre in the twentieth century called the Inchon Landing. Ironically, once the US started winning, it had even less incentive to try to find a peaceful solution. However, what Washington did not realize was that, lulled by the hubris of victory, it was getting sucked into an even bigger war. The Chinese, who had been watching the war with apprehension, had decided that they could not let the Americans take North Korea. They asked Indian Ambassador in Peking – KM Panikkar – to convey warning to Washington that China will not tolerate American forces moving into North Korean territory. India duly passed the warning along, with Nehru pressing the United States to restrict itself to the South Korean side of the border and not enter North Korea. But White House considered Panikkar as an “unreliable” person. They ignored the warning, entering North Korea on 4 October. Nehru grew more and more worried about a possible Chinese involvement as the Americans pushed forward in North Korea. On 9 November, he suggested that certain areas within North Korea, which were important to China, should be made declared demilitarized zones and not attacked by the American forces, so as to not panic the Chinese. This was a creative and well-thought-out recommendation, but once again, it was ignored. Regarding the Chinese warning as a bluff, the Americans drove forward. And so, on 25 November, China entered the war with a massive 300,000-strong force. In Washington, the mood went from celebration to panic. American President Harry Truman was fuming, blaming it all on India, “Nehru has sold us down the Hudson. His attitude has been responsible for our losing the war in Korea”. Nevertheless, cooler heads understood that India was the only way to bring a peaceful resolution to the conflict, and pressed upon him to find a way. Once again, India came up with a plan for peace. Teamed up with Britain, it convinced the Chinese of a ceasefire followed by negotiations as equals. But the Americans would have none of it. They wanted to label the Chinese in the aggressors and pushed for a UN Security Council resolution saying so. Eventually, even London caved into American pressure and sided with it. India, alone, floated the resolution of peace negotiations, but it was shot down. Irritated at the intransigence of everyone involved, India washed its hands of the whole mess for almost a year. In the meantime, the Chinese forces, which had been so successful in surprising and routing the Americans, were stuck themselves. After the initial movement, both sides got fixed in a pointless series of costly battles that did not move the front in either direction. Meanwhile, both sides were trying to negotiate a way out at a place called Panmunjom for many months but weren’t able to come up with any solution. The sticking point was the issue of 170,000 prisoners that the US held. China wanted all of them to be given back. But the US was saying that some of them didn’t want to go back to an oppressive communist regime and United States wasn’t going to force them. In a deadlock, the Americans asked Nehru to step in again. India used backchannels to try to get China to mollify its position and then floated a proposal that found middle path between the Chinese and American position. Once again, the US decided to oppose India position. But this time around, Britain and Canada were willing to break ranks with it and join India. American officials fumed, but finally gave way to the Indian proposal. Now it was communist turn to balk. At the last moment, Soviets and the Chinese withdrew their support of the proposal claiming that the Americans were using biological weapons. To push them to an agreement, Americans started using India as a channel to threaten the Chinese with nuclear bomb. Washington expected that fear of a nuclear attack might soften Peking up. Instead, it hardened Chinese attitude and got them to secretly begin their own nuclear programme with the help of the Soviets (they will eventually test their first nuclear bomb in 1963). And so, the Indian proposal remained stuck for a year while both sides continued to engage in meaningless violence. Eventually, the push came when the Soviet dictator Stalin died in March 1953 and the new Soviet government became amenable to the agreement. Finally, the armistice agreement was signed in July 1953, putting a halt to the war. India became the chairman of the commission which would handle the prisoners and interview them to determine which of them wanted to go back. Once again, it was done over the objections of the United States which held a grudge over India’s previous actions. India dispatched a 6000 Indian Custodial Force to Korea. 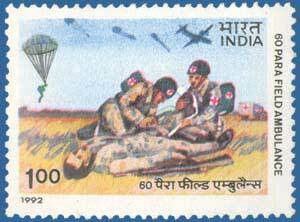 It was a thankless job for which India received flak from all sides. Communists kept delaying the process. Americans got incensed when they found out that 22 Americans held by China had turned pro-communists and wanted to stay back. And the Chinese government insisted that Indians should shoot prisoners if they try to escape. Irritated, India eventually resigned from its position and gave the remaining prisoners back to the United Nations. The Prisoner of War issue was never completely resolved. Meanwhile, Americans kept holding the grudge against India. While the armistice agreement had been signed, both sides were supposed to find a permanent solution to the Korean question through an international conference. Americans, overruling the objections of its allies like Britain, barred India from participating in the conference. The conference proved to be a failure, not being able to resolve any issue. Korea was left in an awkward, hostile situation as it exists today. North Korea, South Korea, China and the United States have been watching each other across the most heavily militarized border for the last sixty years. 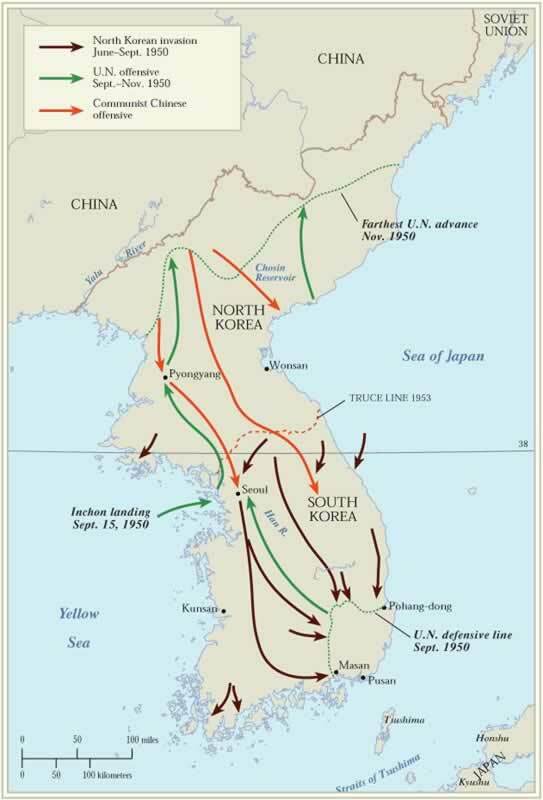 As for India and the US, the Korean War was contributed in deterioration of their relationship. As the Korean War was ending, Americans had begun providing military aid to Pakistan, riling up New Delhi. These two developments, parallel to each other, left much antagonism in the Indo-US relationship. On the other hand, the war elevated Nehru’s prestige to great heights in the world, solidifying his image as world’s leading statesman. For the rest of his life, there was no major global discussion in the world, which could occur without his involvement. Sources: Dingman, Roger. “Atomic Diplomacy During the Korean War.” International Security 13, no. 3 (1988): 50-91; Gopal, Sarvepalli. Jawaharlal Nehru: A Biography, Volume 2. Harvard University Press, 1979; Halberstam, David. The Coldest Winter. Pan, 2008; Kux, Dennis. India and the United States: estranged democracies, 1941-1991. DIANE Publishing, 1992; Singh, Anita Inder. The Limits of British Influence: South Asia and Anglo-American Relationship, 1947-56. London: Pinter Publishers & NY: St. Martin Press, 1993. This entry was posted in Foreign Policy, India-China, Nehru and tagged dulles, indian foreign policy, Korean War POW, panikkar, truman. Bookmark the permalink. Terrific article! Needs more editing to fix tense consistency. Funny attitude towards Neheru in this article. 1) By taking pro Chinese side in korean war, Neheru made US a spot for irritation which fuelled pro pakistani attitude of US till today. 2) Neheru’s imagination about the pro indian nature of China was proved pure false as the China attacked India after thae Korean war. Conclusion of this article is Hunger to become global leader of Nehru detoriated Indian relations with America and blissfully ignoring the fact that a communist country is always hostile to its neighbors [ ignoring warning of Sardar Patel ] doomed India in war in 1962. Beautifully written like a story. Makes me wonder if India is indeed the one true mediator nation the world needs. And, what a man is Nehru!